Game description: Grab your friends, plug in the mics, and get the party started! Now you can sing AND dance to a collection of 50 all-new songs. 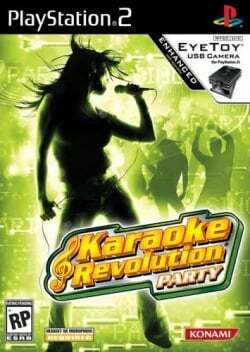 Combined with more multiplayer and party modes than ever before, and support for the EyeToy® USB Camera (for PlayStation®2), Karaoke Revolution Party is the only true interactive karaoke experience. This page was last edited on 9 December 2015, at 11:02.